Stepping Stones: A Refugee Family's Journey is now available in a number of countries and languages. Originally published in a dual-language edition in English and Arabic, this best-selling story of one Syrian family's journey to freedom is now available in Vietnamese (Kimdong), Dutch (Uitgeverij Kok), German (Gerstenberg), Turkish (Nesim), Portuguese in Brazil (Moderna), Korean (Chosen Education) and Spanish (Kalandraka). To order editions in these languages please contact the respective publishers directly. Tender and eloquent pictures fashioned from water-smoothed stones illustrate a wrenching yet hopeful refugee story. "This picture book is special, in many ways. Firstly, the verbal text is well worked and beautifully written. It is compassionate and warm. The English is accompanied by Arabic, making this a dual language text, sought after in public libraries. The illustrations are amazingly authentic...The pictures emanate expression and feeling, astounding from such inanimate objects as stones...the world is a lot better for it. This book, although initially intended for children, is for a global, all ages audience. It is a must for public library and more suitable for school libraries. " "The book is beautifully written in two languages: English and Arabic. Its English prose is straightforward, piercing, and lyrical. The Arabic is no less deft and poetic. It stands on its own and not simply as a translation of English. For example, the translator's Arabic choices for 'juicy' and 'sunbaked' are inspired...'It tells me what people's lives were like in Syria.' For this reason and many others, it is a book worth reading. Its story, in two languages, is beautiful. Its artwork is original and touching. And most importantly, it teaches us empathy and compassion for humans often dehumanized, who live and love the way we too would like to live and love." "Ruurs' sensitive text focuses on the beauty of everyday aspects of Rama's life before the war and gently recounts the mounting problems that cause the family to leave...A book that reflects not just the experiences of Syrian refugees, but one that is a beautiful and timeless reminder of resilience in the face of war as love and caring prevail." A gateway to discussing refugees and immigration with America's youngest citizens...Teaching kids empathy—this is where it starts. "Ordinary beach stones were used to make the three-dimensional collages in this arresting picture book...Stone by stone, step by step, it all adds up to a memorable look at what it means to leave one's home in search of 'a bright new future.'" "[An] excellent book that will help young readers understand what is happening to the children they see on TV. I can't recommend [Stepping Stones] highly enough." "The lyrical phrasing of Margriet's free verse narrative captures the eloquence and simplicity of young Rama's reactions to her experiences...Badr instills life into his stone-art with seemingly simple shifts in background, angles, and minute adjustments of one stone in relation to another." "This is an amazing book!! Every teacher should own one." "Ruurs' beautiful words are twinned with the most stunning artwork by Nizar Ali Badr...I could not but be moved by Badr's work, as it is unlike anything else I have ever seen and conveys so much emotion. I hope this beautiful book will reach the shelves of classrooms, libraries and homes throughout the world and be read and shared many times over." 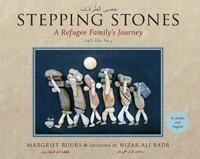 "What a wonderful book!…The illustrations are amazing, created totally from stones…They poignantly display the plight of this family as they leave all they have known behind to seek a new life…This book would be a wonderful way to introduce young children to the refugee crisis that is happening in other parts of the world. Especially now when we have some of these refugee children in our own classrooms throughout the country, the book might inspire some of these children to share their experiences. I would highly recommend this book for every primary and elementary school in the country." "Readers will be fascinated by the stone-collage illustrations created by Syrian artist Badr, who arranges expressive tableaux of people formed entirely of rocks and pebbles...A unique offering that will open eyes and soften hearts." "Readers of all ages will find things of value within the pages of the book...The photographed stone arrangements seem oftentimes to pulse with more life than one might think possible. Whether consciously or otherwise, given his media Badr has create figures that suggest the unbreakable spirit of people seeking freedom and opportunity...This rare treasure of a book is likely to remain highly sought-after for some considerable time...Highly recommended." "Stunning, original artwork both childlike and sophisticated; a text that will both break and mend your heart." "It's exquisite! One can only pray that its message will spread and make the difference we need." "Ruurs writes purely and warmly, with the text set in both English and Raheem's Arabic translation...She deftly conveys the happiness of peaceful childhood, then the confusion and the fears born of war and migration, and the relief and curiosity of arriving at a new home...Each illustration is masterful, with Badr's placement of stones as careful as brush strokes, creating figures positioned to tell the whole story without the benefit of facial expressions...An astonishing book that allows the humanity of refugees to speak louder than politics and introduces readers to one of Syria's incredible artists." "Brilliant and beautiful and inspiring. A book that should be read with every child in the world! An instant classic as solid as the stones on which it is based!" Learn more about the Stepping Stones project and fundraising opportunities at www.steppingstonesthebook.com.